In a recent post I looked at what to consider when buying a hydration pack. Following on from that, I wanted to do a review of a good ‘no frills’ but very functional and reliable CamelBak hydration pack you can use on all your hiking adventures. Let me introduce you to the CamelBak Omega HydroTanium Replacement Reservoir (pictured). Before getting a bit more detail about the CamelBak Hydration Pack, I wanted to suggest reading the guide on how to buy a hydration pack. As far as hydration packs go, the CamelBak Omega HydroTanium Replacement Reservoir is one of the best options available on the market today. This pack comes with the standard bladder, drinking hose and bite valve and has an easy to use ergonomic handle for carrying when filling. When looking for a hydration pack, you first want to look at size and this pack has a nice sleek shape that will fit neatly into most day packs. The volume for this comes in several sizes so you can pick the best one for you. I always recommend going for the largest option, in this case the 100 Oz. The price differential is minimal in comparison to the extra volume you get. Whatever suits your needs best though. The water reservoir itself is durable and leak proof with an advanced design that’s stronger, tougher, and more reliable. This is my experience of it to date but I’ve also read multiple feedback reports from other folks attesting to the same. The pack utilizes a standard tube which comes with the CamelBak patented Big Bite Valve which enables drinking without spillage. The tube is easily replaceable which is great if the tube ever get’s damaged, or if you want to hike in extremely cold temperatures you can add a winter tube which will prevent your water from freezing. Bite valve replacement is also an option for this pack. A key concern to satisfy when purchasing your hydration pack is a bladder that can be easily accessed for cleaning. The CamelBak Omega HydroTanium Replacement Reservoir comes up trumps in this regard as it features at extra large opening which means it’s easy to get at to clean. This also means it’s easy to fill in any sink. The pack is also made using HydroGuard anti-microbial technology which eliminates up to 99.99% of common bacteria and fungus. The final icing on the cake about this neat little hydration pack is that CamelBak will back up their promises with a lifetime warranty. Now you can’t get much better than that! I hope you found this review of the CamelBak Omega HydroTanium Replacement Reservoir useful. It is a good option at a decent price and it has lots of great reviews from many satisfied users. I’m currently using the Platypus Biz Zip LP Reservoir which I am a fan of, so I recommend checking that one out as well. It’s main difference to the CamelBak Omega HydroTanium Replacement Reservoir is that it operates with a zip top as opposed to a screw top. You can also check out our top recommended hydration bladders where we list lots of excellent options. 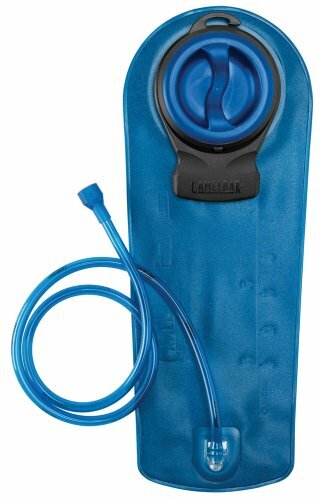 Have you used the CamelBak Omega HydroTanium Replacement Reservoir? What was your experience with it? I’d love to hear about it in the comments below! You know, that’s a really good question Bill. I’ve never actually weighed it when full. A hydration pack itself will vary in weight depending on the size. I have a large one though and it is lightweight enough coming in at 0.2kg. It holds about 3 liters of water which, I think, works out at 3 kg in weight. Therefore, you would be looking at about just over 3.02 kilograms in weight in total for mine when full.